SOLD $232,500! Estate Auction! 3 BR 2.5 BA Brick Home with Personal Property | Middle Tennessee Real Estate :: Maples Realty & Auction Co.
Saturday, November 26, 2016 @ 10:00 a.m.
You don’t want to miss this auction for the Estate of John and Nancy Stanford. The home is a one level with 3 bedrooms, 2.5 baths, rec. room, formal living room, dining room and den. The large patio overlooks a beautiful fenced back yard. 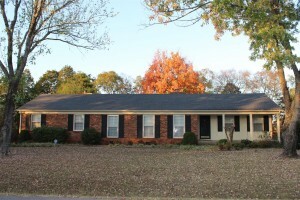 This home is situated on a quiet street, yet is convenient to MTSU, schools, dining and shopping. Personal property: Queen Anne dining table with 6 chairs and leaf, Maple buffet, coffee tables, Cherry drop leaf table, rocking chairs, Pencil Post queen size bed, dresser, full size bed, Chippendale style sofa, Armoire (2), desk, bar stools, card table and chairs, chaise lounge, old trunk, baby cradle, Sony flat screen TV, assortment of paintings, large rugs, quilts, books, iron skillets, iron tea kettle, Cutco steak knives, assortment of glassware, Haviland China, silver plate items, pink depression era glasses, Fitz & Floyd items, collection of rabbits, Japanese Jardiniere, luggage, baby toys and misc. baby items, yard art, bird bath and much more. Directions: From N. Rutherford Blvd., to Old Lascassas Rd., to left on Robinson Rd. Home on left.